Holly's note: I've known Kristi for awhile now, originally through her friendship with my brother. But since my move to Northern California, I've had the privilege to get to know her better on my own and it's been a delight. When she told me she was contracted to write a house-owned series for Berkeley Prime Crime, I was really curious about how that works. She was kind enough to write a guest post about it for Do Some Damage. About a year and a half ago, my editor at Berkley gave me the bad news that we wouldn’t be continuing my Messenger series. I loved that character. I loved writing her. I loved her voice. I loved slipping into her brain. I was going to miss that girl. I wasn’t completely surprised, but I was sad. It was a little hard to focus through the rest of that conversation as I processed that I would not be slipping into Melina Markowitz’s brain again any time soon, at least not under contract. That’s why I barely registered my editor telling me that she really liked working with me and that we needed to find a new project to do together. Plus, I put it down to typical New York publishing let’s-have-lunch-air-kiss anyway. Nothing wrong with it, but I didn’t think it meant anything either. Which is why I was a little surprised when she sent me an email asking if we could talk. Surprised or not, who says no to that? We chatted. She asked if I’d ever thought about doing a cozy mystery. I had, but it had been a while and I didn’t think the project still had legs. She asked if I’d ever considered doing a house-owned series. I told her I wasn’t sure because I wasn’t sure what she was talking about. She explained. The publishing house would come up with a concept and I would write it under a pen name. The house would own everything about the series including the author name. That’s when I totally got it. I said, “You mean like Nancy Drew!” It was exactly what she meant, which is how I ended up writing a popcorn-based, grown-up Nancy Drew. The whole experience has reminded me a lot of the writing prompts from creative writing workshops and classes. I was given specific parameters, a time limit, and the approximate length of the piece. The difference was that rather than writing three paragraphs in twenty minutes about a snow globe I pulled out of a bag, I was going to be writing three approximately 80,000-word books in two years about a woman chef opening a gourmet popcorn shop. Oh. She has a poodle, too. I know some people would chafe at the parameters and restrictions, but I found them to be a relief in some ways. I can be completely undone by having too many options. I was almost unable to make plane reservations to attend Left Coast Crime this year because there were too many decisions to be made. Should I fly out of Sacramento? Oakland? San Jose? Should I fly in Tuesday night or Wednesday morning? United or Southwest? Paper or plastic? Soup or salad? Boxers or briefs? So even though some of the choices weren’t ones I would make, it was nice not to have to make them. Like a good writing prompt, it’s been fun. Even though the concept wasn’t mine originally, by the time I was ten pages in it felt (with some minor exceptions) like it had been mine all along. So do you have any questions about writing a house-owned series? Or do you have a favorite writing prompt? Comment below. 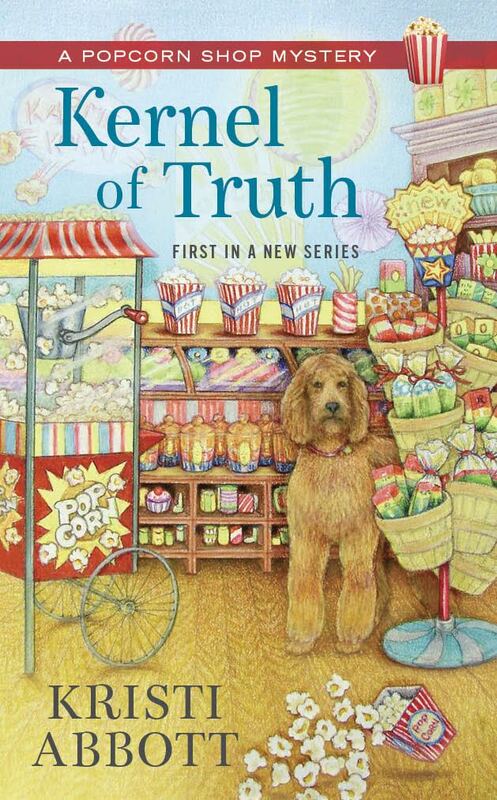 I’ll send one commenter a copy of KERNEL OF TRUTH, the first book in Kristi Abbott’s Popcorn Shop Mystery series. 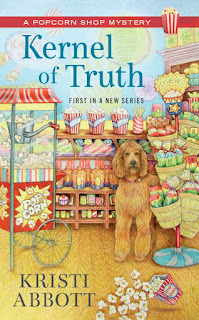 KERNEL OF TRUTH is Kristi's first book with Berkley Prime Crime. She has been obsessed with popcorn since first tasting the caramel cashew popcorn at Garrett's in Chicago. If you've never had it, you might want to hop on a plane and go now. Seriously, it's that good. Kristi also writes as Eileen Rendahl and Eileen Carr. 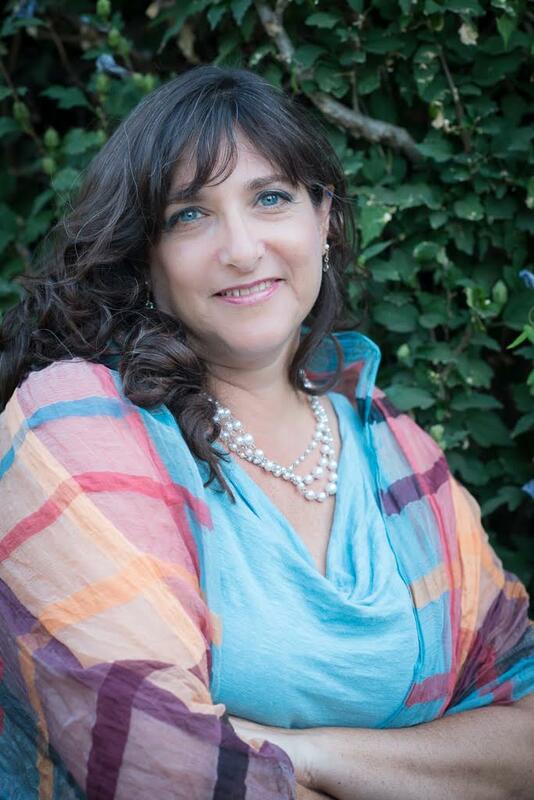 Thanks for writing this guest post, Kristi. I started reading KERNEL OF TRUTH yesterday and I love Rebecca's voice. As I read, I find myself wondering just how much detail you're given when you begin. Is it just the bare bones--setting, basic character info, etc, or do they get specific: she was previously married to a big time chef, what kind of shops the other characters run, her sister is married to her best friend... basically, how much leeway are you given to, as you say, make it your own? Everything you listed were things that were in the series "bible." Things that weren't given to me were things like why she was divorced from the celebrity chef and how she feels about him, what she looks like, what the shops looks like. It's like the skeleton was there, but I had to put the flesh on it. Well, the descriptions certainly made me want to try them, and made me hungry for caramel corn in general. You did a great job with the book and as I said earlier, I am looking forward to the next one.